So we went to the little ticket stand near the corner of Elgin St. and Sparks St. near Wellington to find out what the tour times were, and we signed up for the 2:00pm one on Friday afternoon. Annabelle with her cheerful smile will be happy to help you out! Maybe you've never seen one of these amphibious tour vehicles. Lady Dive calls theirs the "Amphibus". Essentially, a bus that can drive right out onto the water! It becomes a boat! We departed on time at 2:00pm. We were surprised at the number of people on the bus on a Friday afternoon, in fact every seat was occupied although some with only one person. Hint: We found that sitting on the right side of the bus would have allowed better photo opportunities overall. We had sat on the left side, and by the time we realized we were on the wrong side of the vehicle it was too late. Still, good photos to be had from either side once you're on the water. We headed across the bridge to the Quebec side of the river where the boat ramp and marina is. Not really much to see along this route, although our tour guide Bruno was pretty good at keeping people entertained with his stories as we went along. On the Quebec side of this bridge is a series of Canadian Federal Government office buildings that keep 14,000 people employed. What all of these people do, we can only guess! I took this photo from our hotel room to show give you a better idea. Almost all of these buildings on the Quebec side of the Ottawa River house federal government employees. 14,000 of them!! Not much to see until the amphibus gets to the boat ramp. Definitely a neat experience to simply drive straight into the water. This is where you may have been better off getting a front row seat! Looking out the back at where we drove into the river. Once you're on the water there are a lot of photo opportunities. In fact, the water portion of the one hour tour was our favorite part. We found that the land portion didn't give you enough time to take decent pictures of anything they were showing you, and because the bus doesn't stop on land you only get a fleeting view of anything anyhow. Don't forget, you can click on the photos to make them full screen! The famous Chateau Laurier Hotel in Ottawa. The back of the Canadian Parliament buildings with the Parliamentry Library on the left. And the two of them together! On the Quebec side of the river is the Canadian Museum of Civilization. This museum used the be called "The Museum of Man", but the political correctoids had it changed. Now, it's undergoing another change to become The Canadian Museum of History in time for Canada's 150th birthday in 2017. How much is this going to cost? A one time investment of only $25 million dollars. Good thing it's only Ottawa who wastes taxpayer money and not any other city huh? The Canadian Museum of Civilization. The museum is actually the building on the left. The museum's administration offices are on the right.The museum is an interesting architectural structure containing no right angles. A worthwhile visit in itself. Back on land, we drove over to Sussex Drive, a part of Ottawa that houses a lot of embassies and political buildings including the Prime Minister's residence. Again, you don't get a chance to take many decent photos, however I did get one of Ottawa's old city hall. Another interesting story here. The original city hall building is the one in the center of the photo. 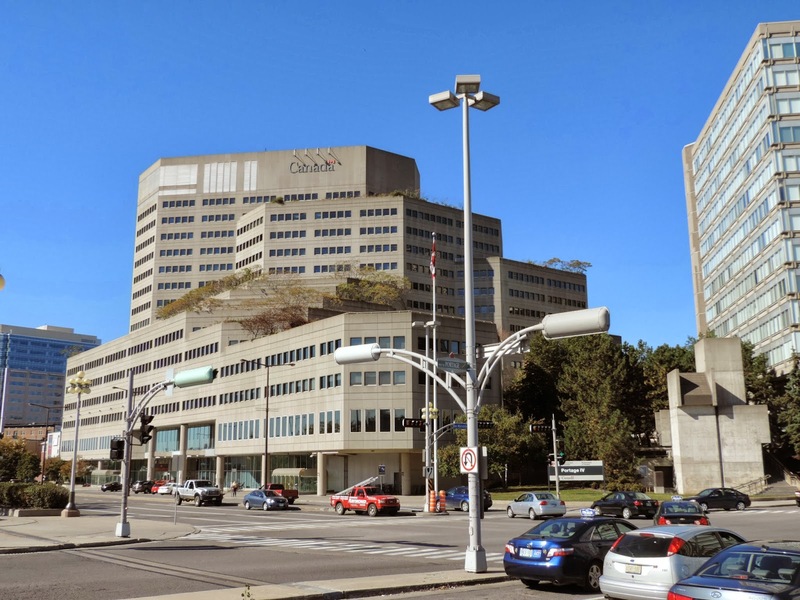 The city council (under then mayor Jim Durrell) decided in their great wisdom to spend $72 million dollars expanding the building to it's current design. Then, shortly after it was built they decided to move to an entirely different location! Like I said, it's a good thing that taxpayer waste only happens in Ottawa and not in your city! Back at Elgin Street, our tour was over. Bruno was a good tour guide, and we enjoyed the trip. It's a little expensive at $35 (tax included) per adult, but the boat portion of the tour is fun. I think you would be better off buying the package that allows you to take the hop on - hop off bus tour as well. This would give you ample opportunity to return to some of the sights you saw on the Lady Dive tour that doesn't stop anywhere. Sounds like fun! Justin and I did the amphibious tour in Halifax (the Harbor Hopper) We really enjoyed it! If we ever move back to Ottawa, I wouldn't mind working at The Chateau Laurier again. I remember how much fun you had working there! It would definitely be a great place to work. We have never done such a tour. Do they still have the smaller boat tours on the river? Ottawa has changed and looks so grand. Never knew that they had small boat tours on the river. They do have big boats that do tours on the river and also tours on the canal. LOL, the $35 is nothing compared to the $104.37 (plus tax) you would have paid for each of your bungee jumps! Yes, the bungee jump was a little expensive too...sure is fun though! What a fun thing to do. Thanks for all the insider tips so we'll know exactly how to do it. Probably one of those one and done things so just pay for it. Next year you won't remember what it cost! It is definitely something that is different to do and you know us, we are always trying to find stuff that is unusual to do. Y'all are going to 'blow' all of that hard-earned $$$ before you ever get to Africa, at this pace... The 'bus' looked a whole lot safer than the 'amphibicar/duck' !!! I've even seen a YouTube video of a big class A motorhome/water-craft !!! Glad y'all got to do this and took 'us' along... It was fun !!! Hope this is another one of your HAPPY DAYS !!! Love the idea of a motorhome/houseboat idea, you could just about go anywhere then! Not unless you want to get wet! Love those amphibious bus tours, we did one in Branson MO and one in Memphis TN, both lots of fun. They seem to be becoming more popular now and can be found in many cities around the globe. Love these tours of Ottawa, it's one of our fav Canadian cities. Thank you, and Happy Thanksgiving! Glad you are enjoying our tours. Happy Thanksgiving to you and John.